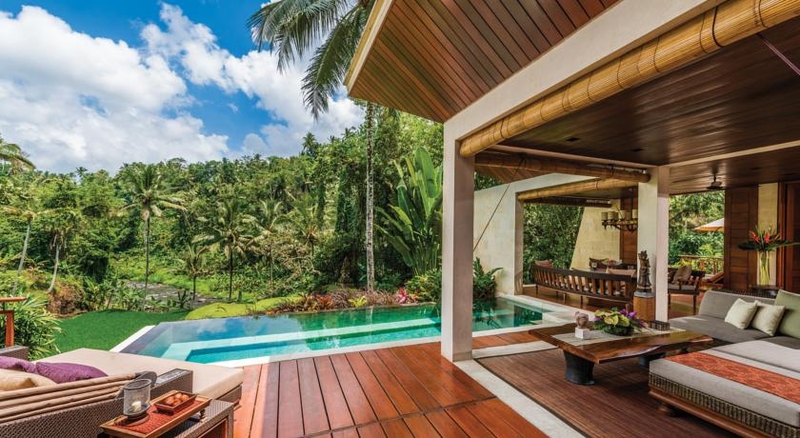 Four Seasons Resort Bali at Sayan is an intimate riverside retreat in the central highlands near Ubud. The stunning lotus pool seems to be suspended above treetops and Bali's sacred Ayung River. The resort offers a few dozen enormous suites and private villas on 17 acres deep in the Bali jungle. Come and experience the secrets of Eastern relaxation at the elegant Spa. Dine on the breathtaking valley's edge. Four Seasons Resort Bali at Sayan is proud to be recognized as one of the world's very best resorts on the Condé Nast Traveler's Gold List 2012. Escape to one of the Resort's 18 spacious suites and 42 private villas in natural, serene beauty. Each resort room is appointed with rich teak furnishings and exotic hand-loomed fabrics. The generous bathrooms feature terrazzo tiles, double vanities, deep soaking tubs and separate showers. Compare our luxurious resort rooms or view our special offers and packages. Tour the area and discover the island's artistic traditions, visit its temples and explore its villages on foot or by bicycle. Challenge yourself with a round of golf, a game of tennis, or a day of rafting on the Ayung River.